Mandy has graciously posted instructions on the slip stitch technique which she has decided to call Indecisive Stripes Rib on Ravelry. Here is Norma with her Alice Starmore Sweater, which she knit stranded but did duplicate stitch repair the elbows. I could not looking close where she had patched and she was pointing it out. 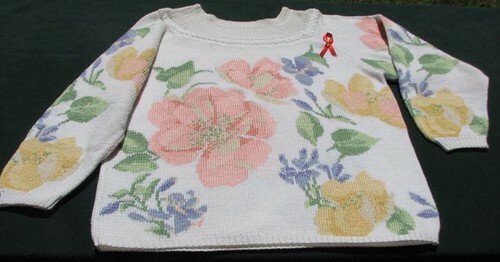 Here is a sweater that Norma did duplicate stitch, - impressive! She finds duplicate stitch relaxing and dislikes intarsia. 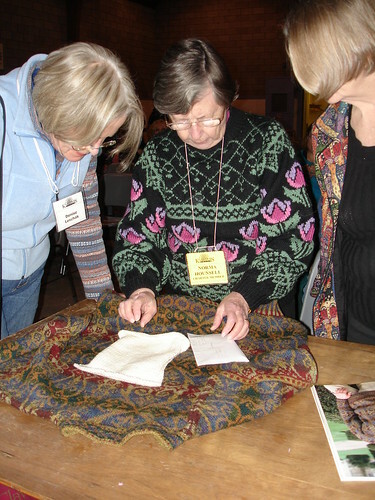 Lynne also was taken registrations for the workshops being held the weekend of February 27th-28th. Registration is currently open to guild members only and on February 1, 2011 it will be open to the general public. For more information see the details in the newsletter. Our next meeting is February 8. See you then!